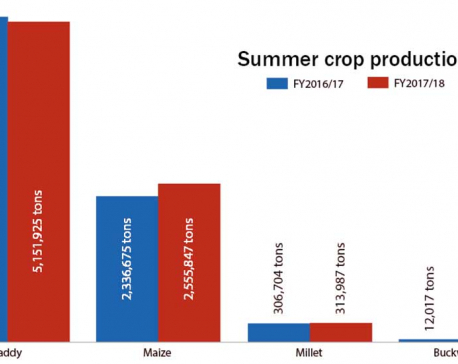 KATHMANDU, August 29: Paddy plantation has declined by five percentage point this year, indicating that the country’s staple crop production will see a decline. Paddy plantation was done only in 92.83 percent or 1,441,098 hectares of the total land in which paddy is cultivated. The total cultivable land is 1,552,469 hectares. According to data compiled by the Ministry of Agriculture Development (MoAD), 97 percent paddy plantation was done last year, and the country had seen record paddy production of 5.23 million tonnes. Late monsoon and floods in tarai hampered paddy plantation, according to Shakar Sapkota, deputy spokesperson of MoAD. According to a recent flood damage assessment, paddy planted in 25,632 hectare in the eastern and central tarai region were damaged by the floods in the second week of August. The ministry data shows that paddy has been planted in 410,338 hectares of land in the eastern region and 367,087 hectares in the central region. Likewise, the planted areas are 310194 hectares in the western, 176,919 hectares in the mid-western, and 176,560 hectares in the far western regions. According to the ministry data, Jhapa, Morang, Sunsari, Saptari, Siraha, Dhanusha, Mahottari, Sarlahi, Parsa, Bara, Rautahat, and Chitwan districts could not complete paddy plantation due to heavy rainfall and floods. Dhanusha, Mahottari and Sarlahi districts had only 58 percent of paddy plantation. 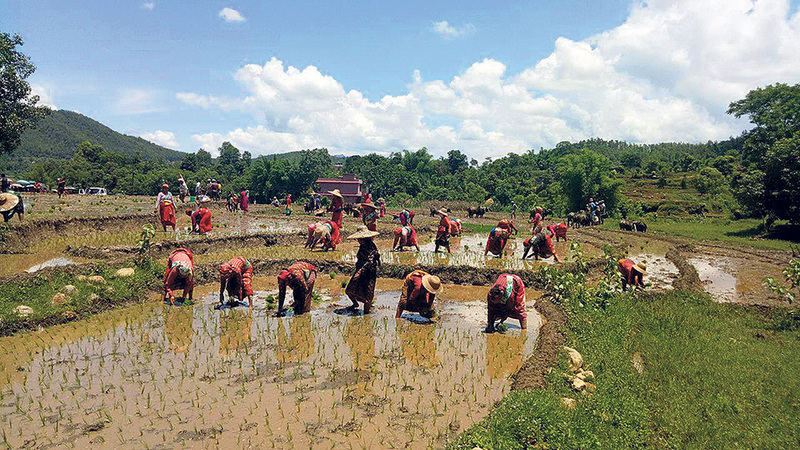 As the country witnessed late monsoon this year, districts such as Ramechhap, Dhading, Kapilvastu, Rupandehi, and Nawalparasi planted paddy later than the normal times. “Paddy plantation in 92 percent of cultivating land is satisfactory though,” said Sapkota. Paddy alone contributes to 20 percent of the total agricultural product, which has a share of about a third in the country’s gross domestic product. This may also affect the country’s economic growth outlook which is aimed at 7.2 percent.